Harness the power of the Infinity Gems! Seize control of your coffee with this exclusive molded mug! You are the Titanian Eternal - Thanos! Awesome prop replica of the Infinity Gauntlet. Entertainment Earth Exclusive! Harness the power of the Infinity Gems and seize control... of your coffee! 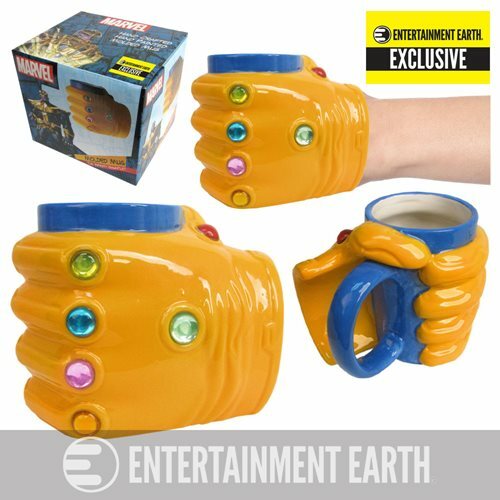 Featuring the six Infinity Gems, the Marvel Thanos Infinity Gauntlet 16 oz. Prop Replica Molded Mug Entertainment Earth Exclusive is a fun way to hold 16 ounces of your beverage, and it's also a fantastic prop replica. This is an excellent choice for any fan of Marvel. Bring home the power of the universe and heft your coffee like the Eternal of Titan! Made from ceramic. Hand wash only. Not dishwasher safe. Do not microwave. Ages 13 and up.